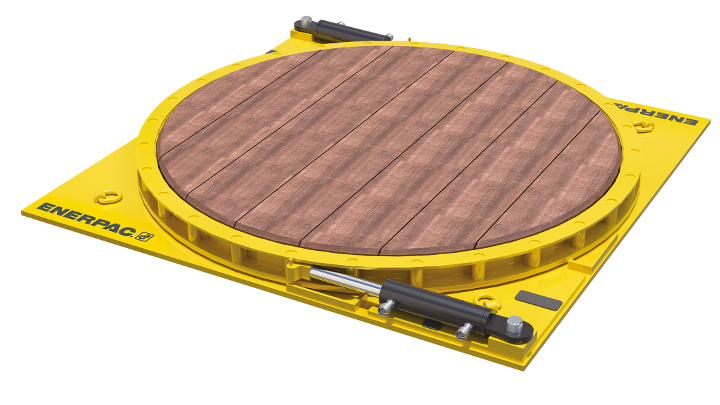 Heavy lift systems specialist, Enerpac Heavy Lifting Technology, announces the ETT-Series Industrial Turntables to facilitate safe repositioning of heavy or oversize loads. The ETT200 and ETT400 Turntables simplify handling, adjustment and precise orientation of loads up to 200 and 400 metric tons respectively. Designed to complement the SL-Series Hydraulic Gantries and/or LH-Series Low Height Skidding Systems, the ETT-Series Turntable serves a vital role in the handling of heavy or oversized systems such as industrial-scale presses, transformers, motors or engines, permitting smooth, precision rotating before, during and after skidding and lifting operations. The new ETT-Series Industrial Turntables are designed to safely rotate almost any large or heavy load, even in the most restrictive spaces, using Enerpac’s robust hydraulic cylinder technology. With a low-profile design of just 150mm in height, the ETT Series Turntables provide exceptional load stability. The system is driven by either a single, double-acting 25-ton capacity hydraulic cylinder in the case of the ETT200, or by two cylinders in the ETT400 to achieve 400-ton handling capacity. Both models offer smooth, tightly-controlled rotational power and can be operated with standard Enerpac hydraulic pumps. The turntable’s 1825mm diameter platform provides controlled zero-turn capabilities in an efficient footprint. The Turntables feature a durable hardwood surface, 700 bar cylinders and 360-degree, bi-directional rotating capabilities made possible by a highly-accessible cylinder ratcheting system. The system is easily transportable by four integral lifting hooks, sets up quickly and weighs just 1700kg. “The portable ETT-Series Turntable positioning system easily pays for itself in productivity gains and improved efficiency during device installation, removal or maintenance, while protecting workers from potential injury caused by attempted manual rotation during skidding operations or suspension,” says Jeremy Stubbs, commercial director, Enerpac’s Heavy Lifting Technology. For more information on the Enerpac ETT-Series Industrial Turntables, visit www.enerpac.com.